Here in Part 3 of the animated gif tutorial, we are going to import our short movie scene into Adobe Photoshop to finish up the finalized product. 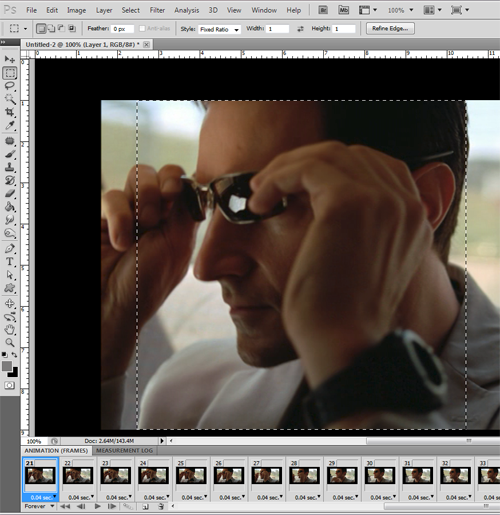 There are so many screencaps that I have divided the Photoshop segment into two posts. This tutorial will continue directly in Part 4 today. Also, I used low quality images to speed up the page loading times. Many of the images will enlarge if you click on them. Import that clip into Adobe Photoshop to set the timings. ◄ You are here! Finally, add the text, resize the image and save for the web. Install Adobe Photoshop if necessary. If you have another version of Adobe Photoshop, this tutorial might work, depending on which one you have. 2b. Luckily, Adobe includes the 32-bit version of Photoshop with their 64-bit version. If you received the above message, we need to close Photoshop and then open the 32-bit version of the program. To do this, click the Start button on your computer, and in the Search box, type (or better yet, copy and paste) the following path with the quotes: “C:\Program Files (x86)\Adobe\Adobe Photoshop CS5\Photoshop.exe” Then click on the program name at the top of the popup box. You can see the version while the program loads as shown in the screencap below. Now the 32-bit version should open! 2c. If you had to reopen Adobe Photoshop, again go to the File menu, then Import, then Video Frames to Layers… as shown in step 2a above. 3. If necessary, navigate to the folder containing the movie clip you created in the last lesson. In my example, the folder is C:\Animation. Select your short video clip. Mine is GIF01.mov. Then click the “Load” button (not shown in the screencap). 4. In the box that appears, make sure that “From Beginning to End” is selected. Put a check in “Limit To Every 2 Frames” and make sure there is a check in “Make Frame Animation” as shown in the screencap below. Then click the “OK” button. 6a. To get an idea of how animation works in Adobe Photoshop, click the little play button near the bottom-left-hand corner of your Animation panel. If the animation plays and then stops, click the little down arrow where indicated in the screencap and choose “Forever.” We want our animated gif to loop indefinitely! 6b. When you’ve watched your animation enough, click the “Stop” button. 7. Next we want to crop our animated gif image into a square. To do this, first click the Rectangular Marquee Tool as shown below. 8. We want to crop our image into a perfect square. We’ll deal with the size later. 🙂 One way to draw a perfectly square selection is to hold down the Shift key on the keyboard while dragging with the mouse. Here’s another technique I discovered that you may like better: Make sure the Rectangular Marquee Tool is selected, then choose the “Fixed Ratio” style, and finally type 1 in the width and height boxes. Now you can make a selection with a perfect square of any size! Try to avoid the black frames if you have them in your video as I do. 10. To complete the cropping process, click on the Image menu, then Crop. In the Set Delay box, type 0.08 and click the OK button. 13. This would be a good time to save our work before we move onto part 4 which follows directly. To save your file, click on the File menu, then Save. Be sure you are in the correct folder. I’m in C:\Animation. Give your file an appropriate name. I’m naming my file Animation01 in Photoshop’s PSD format for now. Then click the “Save” button (not shown in screencap). Click here to go onto part 4! Cannot download the adobe. They ask for a Adobe ID I donot have. 😦 What must I do to finish my clip into a small one? @Jacqui, I’m asking a friend to help with your question. In the meantime, perhaps a Google search will be useful? @Dhana: Thanks for the information! 🙂 Hope this helps you, Jacqui. If you send me a message through the Contact bccmee I can tell you how I did it. @Jonia: I know you already make animated gifs so I’m interested in hearing if you like this method. 🙂 Please let me know! Thanks for your comment and I hope to hear back!